My goodness, God is good. Last weekend I just heard all these preachings from my pastor and on TV about having faith regardless of the circumstances. I just nodded and I agreed and rejoiced, boy, I thought, what a message! On Tuesday, before going to pick up my kids from school, I was hearing another preaching and the pastor mentioned how within an hour things can change so dramatically. He gave examples of people he knew. I just thought- that is hard to go through. Later after picking up the kids, I was driving and, somehow it's always on Tuesdays, within an hour of hearing that preaching my husband called me. He said that he was fired. Boy, did my world turned upside down that day. It was unfair and HR made some decisions which I think was unfair and I don't think was right. I don't say this because it was my husband that got fired, I'm fair. My thoughts after hearing he was fired went wild. I just thought how are we going to pay our mortgage and bills. But, especially the mortgage. that it's in the valley I grow. and my growth is very slow. but it's in the valley I grow. Thank you for valleys, Lord. For this one thing I know. Today is the day we have a list of interesting Etsy shops listed on my blog. Check these shops out, I promise each have unique and cute items. I usually have this list opened and Etsy shop owners drop by and add their shop's link. But, today we are having a giveaway! To my readers check out these shops and post here your favorite item including shop's name. Our baby turns 5 years old today. She reminds us that she is no longer a baby yet when she is tired when we are shopping she still extends her arms up at us so we can carry her. What a blessing. I really love my kids and I thank God for them. Although, sometimes it may get hectic and chaotic here, I don't regret being a part of this family. I'm thankful for my family. I have not been creating pieces of jewelry lately and I feel I'm putting my business down and I feel guilty. I need to buy some pastel colored beads and crystals to start creating Spring inspired jewelry. Need to go to a bead show and get the latest colors and shapes. I want to take a small trip maybe during Spring Break. My kids love San Antonio and I love Austin. My husbands doesn't mind where we go as long we go somewhere. My daughter wants a party and I think we will celebrate her birthday next week. I will use this special occassion as an inspiration to create a cute girls bracelet, too. I'm looking around to find inspiration because I have been very busy with my family that I feel tired to even create a nice jewelry piece. Okay then I'm gonna create something today, even if its just a pair of earrings. I'll post these pics Monday. Can you believe it, it's almost spring. I love this season. I love to see when bare trees start showing hints of life as leaves start to emerge and you see bits of green. I love to plant flowering plants around our Oak tree that's in our front yard. I'm thinking of planting some along our driveway this year. We had a freeze a little over a month ago and our South Texas native trees took a beating. They seem to be dead, my husband assures me they are green; thus, they are still good. I'm tired of seeing these "dead" plants. I'm so tempted to go and buy new plants especially flowering plants. But, I'm told just wait a few more weeks. I can't wait!! But, that means winter is out and although I'm not a fan of cold weather, I love hot chocolate. My very favorite is mexican chocolate called chocolate abuelita. I'm Mexican-American and most Mexican-Americans have tasted chocolate abuelita. It's a roundish dark chocolate something similar to chocolate bar but it's hard. This bar is place inside a deep pot with milk and is boiled. When my grandma made some when I was a kid, she would use a tool called a "molino" and you would place this between both hands and move this spiral looking wooden contraption up and down your hand. Amazingly, this would mix the hot milk and melted chocolate and froth would form. A ladle was used to pour some delicous chocolate abuelita into mugs. Now, I make some for my kids and they love it. I use a wisk or sometimes I don't make it that boiling hot and pour it into a blender, easier :) The taste is like nothing you have tasted before. It's rich dark chocolate with combination of vanilla and cinnamon is absolutely delicious. It just brings back childhood memories and memories of my grandma, who passed away 20 years ago. The packaging is unique as well, it has a picture of an old lady. This old lady is actually a famous Mexican actress, Sara Garcia. Although, she has passed away many, many years ago, she is remembered for her famous movies in Mexico for portraying grandma roles. I believe to honor her, the makers of chocolate abuelita uses her picture. Also, I must add that "abuelita" is Spanish for grandma. Chocolate abuelita has always been sold as a bar. Just yesterday, I found at a local grocery store, chocolate abuelita in granulated chocolate drink mix. It's suppose to be easier to make. I still haven't made some of this new granulated form, and I wonder if it's the same taste. I think I'll make some chocolate abuelita tonight. Once hot weather starts coming in, I'll have to brew tea to make iced tea or squeeze lemons to make lemonade. But, as long it's winter I'll be make chocolate abuelita and every time I sip some chocolate it'll be in honor to my abuelita. I'm not getting monetary incentives for mentioning this. This is based on my opinion. Good Morning! Today it's not sunny like yesterday, we received a cold front and it's gloomy and raining. I really miss sunshine peaking through my window treatments. But, can't complain because today is our very special day, it is Tuesday. All Etsians are welcomed to leave their link to their Etsy shop here for FREE. I really love doing this and I hope to see new shops. To my readers, come on in and click on these great shops that I'm sure you'll find something great. Comments are welcome. Enjoy! disclaimer: I don't receive any monetary incentives of any kind, I don't favor one shop over another. This is free simply because I want it to be free with no strings attach. This is indeed a wonderful day our Lord has made. I feel energized, it seems that every Sunday that we go to church, I have recharged my batteries and am able to tackle the new week easier. Last week, I had a cold plus one of my kids was recovering from a bad cold, too. My husband and my oldest son went to church without the rest of us. On that Sunday, I didn't get to "recharge my batteries" and the rest of the week didn't run smoothly. As a Christian, we need to hear God's word. Thank God there's TV and Internet where we can listen and see great preachers and hear God's word. But, that doesn't take the place of being in God's house. For me attending church is like I mentioned above, it's like recharging my batteries. I can take my burdens and leave it at the altar and have God take care of it. It's like a heavy burden being lifted off my shoulders. I feel like I can breathe again, I feel light, I feel energized, I feel like yes, I can do it because Jesus Christ strengthens me, and I can see better because His word is my light. Regardless, of trials and struggles, I have peace and have faith that He is with me and He will lead me through any fire. If you are going through something, just remember you are not alone, He's with you. If you need prayer, just post it here in my blog and I will pray for you. God Bless. Wow! It's Tuesday and I promised myself that in 2010 I was going to blog more and I haven't. I have been busy with family. There has been doctor appointments, bake sales, parties to attend, practices, plus house work. That had me so, so busy. Oh, my! I have even consider, maybe, hiring a helper. But I remember I can't afford that right now so I just have to tough it out. Lord, help me. Ok, this is our special day here at my blog for all Etsy sellers. I know sales have decreased so some of us and some of us cannot afford advertisement. I just wanted to be of help because it also helps me. Every Tuesday all Etsy shop owners are welcomed to add link to their Etsy shop here, in my blog. The best part is that it is totally FREE!! We get to expose our shops and who doesn't need exposure. All you do is check us out every Tuesday and add your link. Tell friends, too. I'm thinking of adding etsy mini's here, too. I'll contact some of you so you can email me the htlml. For our readers, please go through each link that I'm sure you will find something fabulous. Disclaimer: You add your link for free, I don't get paid nor I get in return favors or items, nothing like it. I do this because I want to with no hidden agendas. Disclaimer: This blog doesn't get any monetary incentives nor do we get free products. We don't favor one Etsy shop over another. Everyone is treated here the same- with respect. All Etsy shops are welcomed to add their link for free. Just keep in mind we are a family-friendly blog. Hello, I'm a member of the Etsy Texas Crafters (ETC) and we are having a first Monday sale. This goes on every 1st Monday of the the month. Check out our fellow members and you will find something you may want to get. Post here any comments on which item you liked, too. Check ETC at http://www.etsy.com/forums_thread.php?thread_id=6423385 there's 57 shops having specials offers and sales. I hope you have a happy Friday and great weekend. I had sick kids this week and they are better. Thanks to those who wished them a fast recovery, I appreciate that. Now, I'm so behind and there's pictures I need to take and posts that need to be posted. A couple of days ago, I was not feeling well either, I think it was just stress related. As a mother, and I know I have mom readers, we just get stressed when our children are sick. We feel like no one else can take care of our babies like we do. But, at the end we are so and I mean so burned out. I have struggled with accepting my husband's help when the kiddos are sick. I have learned and it has taken time to realize that I can't do it on my own. My human nature or motherly nature takes over and I feel like I can do it all. These are the times I have bump into walls and gulping down my pride I realize and it's hard to accept that I am wrong. This week I hardly had any time to create something cute. Yesterday, I found two blush pink glass briolettes which I'm already brainstorming what I'll do with them. I'll post a pic and list my creation in my Etsy shop. I'm thinking Quincenera earrings. Well, have a fabulous Friday and weekend, too. Your comments are welcomed, and God Bless. Disclaimer: I don't get anything in return by letting these shops add their link here. I don't favor one shop over another either. It's Monday and I feel rested. Although, I had 2 sick kids, I was home all weekend and we rested. My poor daughter had a horrible constant cough and threw up a few times. She's our baby and she knows it that when she gets sick she wants to be carried. Our Meaghan is 4 years old! My husband patiently carries her around the house. Today, she had to stay home because she needs to see her doctor. Well, I called our doctor and she wasn't going to be in today. The good thing is that my daughter has no fever, but, she feels a bit weak and doesn't want to eat much. My oldest was sick, too, but he felt better today and he didn't want to miss class. We have four children. My other two children were bored because they didn't know what to do. My husband took them outside to help him with the yard work while I stayed inside with 2 sick kiddos. I looked at them from the kitchen's window they were running and they were having a great time helping Daddy. I just thanked the Lord for my family. Because although we get sick sometimes of the common cold or other common ailments, I still have a healthy family. One of our kids suffered from asthma and very bad allergies. Just going outside would sometimes trigger an asthma attack. But yesterday, he was outside running and helping and laughing, that brought tears to my eyes because he is better. Lord, I'm thankful for that and many other things You have given. That's how wonderful our God is. He heals us from diseases, from physical pain, from emotional pain, from all types of pain. Even something that seems impossible to doctors, for God, there's no impossible. That's why we should "cast all our anxiety on Him because he cares for us" and He will take care of us, too. Because I know where my help comes from, I always will come to You. That's why He deserves all worship and praise and all honor and all glory. Thank you, Jesus!! Hello, this is our special day of the week. Every Tuesday Etsy shop owners are welcomed to add their link to their shops here on my blog. Take the time and go into each shop, I'm sure you'll find something awesome. Also, you're welcome to leave comments on your favorite items you found inside these shops. Enjoy and have a blessed day. 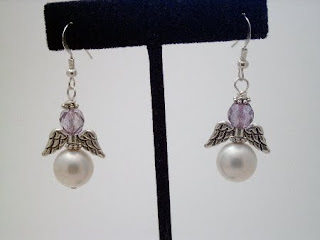 Hi, I was working on a couple of angel earrings in red just in time for Valentine's Day and other earrings designs. I will be adding them to my etsy shop tomorrow. Also, I just want to remind you that tomorrow is Tuesday Tailor-made or handmade where you are allowed to post a link to your etsy shop. I've been wondering what cool title I can use for our Tuesdays. I was told Tueday Tailor-made was neat, but others say it's not catchy enough. So, how about you guys suggest what we should name our Tuesday's. Again, for those who have missed it, on Tuesdays I let etsy shop owners add their link to their etsy shop for free. This is every Tuesday. Last week, I was sick and didn't get to do it, but that won't happen again, sick or not, I will post. If you own an etsy shop or know someone who owns an etsy shop, let them know. Plus, every 1st Saturday of the month I let other mommy shops to add links, too. Whew!! That's so much, but I do it because we all need exposure to our shops and why not for free!! Disclosure: I don't get anything for allowing you guys to add you link here in my blog. Nor do I favor someone over another, nothing like that. This is just simple, add link to your shop for free. Of course, do remember this is a Christian family-friendly blog. If I see a someone adding a link to something totally the opposite of what we have here, I will remove it. But, thank God, I haven't had any problems and I am believing we won't. I am currently working on a list that I want to share with you. This list is of cool gifts that I found on etsy. Now, I have friends that don't have an etsy shop but a regular online shop and I want to make another list of those shops, too. Today, I'm working and sending out emails to those friends that might be interested so they can send me a pic of that cool gift found in their shop. I'm looking for more mommies. I'm only asking for you to post a comment that you are interested and with a link to your site so I can check it out. I will then pick one item that I find to be cool in your shop and we will go from there. Next month, I will be sharing those cool gifts here in my blog. If you know someone who might be interested in being featured in my blog, let them know and again I just ask for comments here about your interest. Thank so much and have a blessed rest of the week. I've been working and I hope you enjoy these couple of earrings I made. There are two pairs made with lampworked beads. I would love to learn how to make lampwork beads, by the way. I got these beads from a local bead shop and they are lovely. Also, I've included a pair of red earrings because Valentine's Day is approaching us. They are made with Czech beads and they are cute, too. Everyone needs a pair of black earrings and clear white earrings. These colors are neutral and go with most outfits. I want to mention that I've added a $3.25 section in my etsy shop where you'll find earrings for low as $3.25. Plus, you'll see that I'm offering FREE shipping, what a deal. Check my etsy shop for more items. I have joined a great group named Moms United in Business and Jenn has great ideas. One of our assignments was to write down our business goals for 2010. She listed her business goals and her weakness in running her business in 2009. My weaknesses were similar to hers. It was an eye opener. Last year I was all over the place, trying to do so much for the business, I also didn't have sense of direction, I didn't know what to do. I would read advice columns from one blog and jump to another. My biggest was lack of organization. When it came to business I lacked it totally. Boy, it was hard to accept it; but, it is true. I have learned in these few days of the new year that I need to seek His will before doing anything. I wasn't doing that. Yes, I am a Christian, I go to church, I pray; but, I was not going to Him when it came to the business. How silly was that. I felt so bad once I recognized what I was doing, or in my case wasn't doing. I do love my Lord and He deserves more than I was giving. I have felt that the Holy Spirit showed me my weaknesses. After seeing that I have changed things, now, I'm trying to be organized and have posted my to do lists for the business and my business goals for 2010 in my "studio". I feel this will give my sense of direction. I have read Jenn's advice and have decided to learn from her (I do need a business mentor). I am seeking His will, I've learned about my weaknesses and this helped me write down my business goals for this new year. Whew! It took time to realize what I was doing wrong but thanks and praises to the Lord for showing me. What are you weaknesses? Finding out what they are will defenitely help you write down your business goals. Because this year will be the best year ever. Before I show you a cute pair of earrings I made last night. I have been praying and asking the Holy Spirit to guide me and this just came to me while praying and while listening to this neat song. I want to share this with my friends and I know many of us are going through some trials and storms and tribulations reason why I'm sharing this. While praying I had the radio on to a Christian station and a song by David and the Crowder Band was on. I had heard that song before but while praying it made me realize something. This song mentions about how He loves us, how we are a tree and He is a hurricane. That just brings tears to my eyes because I realize something that's true. He takes us through these trials and tribulations and storms in life to strengthen us. He is a hurricane that bends us to make us strong so we may not break. Every trials is difficult than the one before. He doesn't give us what we can't handle. He knows us and knows what's ahead. Sometimes I forget and try to solve problems myself, my way and I just bump into walls. Then I realize my human nature and repent and go the Lord for His guidance. Yes, I'm a tree that needs those strong winds to form strong branches that won't break when trials and storms come. I want to be in peace that surpasses all understanding and know that He is here with me and that the fire might be close but He won't let it burn me. I know he's got plans to prosper me and not hurt me. I can do all things through Christ who strengthens me. And how can we get there if it's not by having our branches bent here and there. Sometimes it's hard to understand why we go through those trials but He love us so much that He let it happen for a reason. "How he loves us..." Lord, you are wonderful and a loving God. Handcrafted or handmade..are what these wonderful shops do and sell in their Etsy shops. Making an item takes hard work, imagination, and so much more. There's also shops that sell unique materials and vintage items that are also equally beautiful. Take a moment and click on these shops and see what wonderful items you can find. I'm trying to find a spot in my house to make it my own, my own studio. It's difficult when every corner has been invaded with storage bins stuffed with kids toys. I've been looking at one particular corner for sometime now but it's on the way to the laundry room and it's at a corner of our dining room. However, I think I'll just use this computer armoire and convert it into my "studio". We are in a tight budget and building an extra room, which would be fabulous if we did, is out of the question. My old armoire is located in that corner that I mentioned above, on the way to the laundry room in our dining room. This particular corner is actually my corner of shame. That poor armoire is a catch all, and it is stuffed with so many things that I won't be surprised to find my lost favorite pair of earrings in that pile. Well, today is the day I'm going to tackle that corner and make it my own. This is a picture of that corner and you'll realize why it's my corner of shame. Anyways, I'm gonna clean this pretty and I'll post an after picture of my "studio/armoire". My kids are still off on vacation and running inside our home. So, I'm sure it'll take me most of the day to get this cleaned and organized with my beading supplies. Hello, every Tuesday I will open a space so my friends can add a link to their shops for FREE. This is for etsy shop owners. I will have something special the first weekend of each month for Moms with businesses. Etsians this is for you, you are welcomed to add a link to your etsy shop. Etsy shops having a Christmas sale!! Attention all etsy shops having a Christmas sale, or any type of sale in your etsy shops, of course, feel free to to add you shops name here below. Take advantage as Christmas is fast approaching us. This is my favorite holiday and I just love to see Christmas decorations, I love to sit and see our Christmas tree all lit up at night when everyone is asleep. But, most importantly, I love the celebration that a baby was born who later would die to pay for our sins and resurect to give us victory. Victory in everything we do, in accordance to God's will. I just think and see really "The Lord is good!!". Although, this year brought many challenges and trials in our family's health, our finances, and so many other unexpected moments, I have always felt that He is with my family and I, always leading us through. I just can't imagine what me life would have been if I didn't know Him. I would be roaming around with no peace, no joy, and no hope. But, because I know Him, I have peace that surpassess all understanding, I have joy that no one can take away, I can laugh although we are going through trials and tribulations, and I have hope and faith that my God will change it all in a blink of an eye and give me blessings in abundance. Merry Christmas and many blessings from my family to yours. Fresh Radiant Skin Care Blog for Women with Issues! The Secret Life of a Juicy Christian! I've been designing one of a kind beaded jewelry for 6 years. All my handmade jewelry is made with high quality stones and beads including Swarovski crystals that I've hand picked. I specialize in inspirational unique jewelry for everyday use. Also, you will find special occassion inspirational gifts. All jewelry is made with sterling silver findings. You'll find earrings, necklaces, chokers, an bracelets. Also, we specialize in earring designs as there are many styles you'll find, from dangle to chandalier from simple to elegant. Get a free html hit counter .